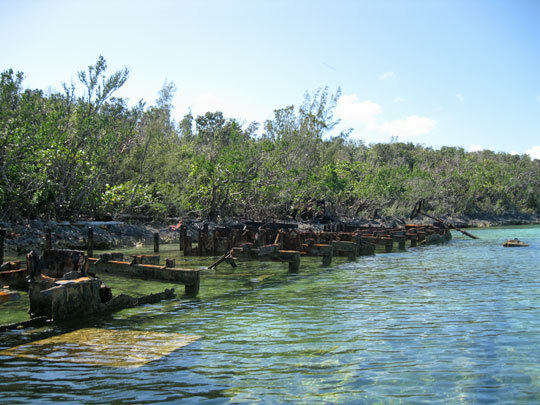 One of two visible ship wrecks off of Crab Cay. Iâ€™m sitting in the cockpit watching and waiting for another spotted eagle ray to leap out of the water. These guys are dark with white spots on their backs and pure white underbellies. Their wing spans exceed four feet. They leap into the air and give those wings one big flap, as though this leap will be the time they take off flying into the air. But no â€“ a big splash and they are back under water. The Atlantic Ocean off the coast of Man Jack Cay. I got an overhead view of one as we anchored here in White Sound at Green Turtle Cay. The ray passed under the boat a couple of times showing off itâ€™s spotted topside. Since then we have seen a few leap. The water is still cold. But I have been able to swim some in the past couple of weeks. Iâ€™ve done some snorkeling, but mostly I just put on goggles, leave the flippers on the boat, pick a destination, and swim out and back. At Great Guana Cay we anchored at Fisherâ€™s Bay and Bakerâ€™s Bay. Out in the center of the bays itâ€™s flat with a grassy bottom. The water is crystal clear. You can see lots of sand dollars, starfish, and an occasional sea slug. The slugs are over a foot long, have a tough looking brown hide, and squirt fluid out each end as a defense mechanism. Big rock in the Atlantic Ocean. 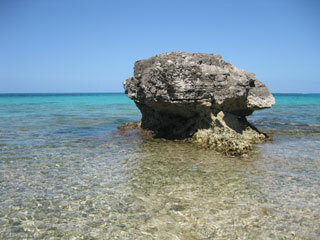 Deliaâ€™s Cay in the Fisher Bay anchorage is rocky. Close to the cay sponges and anemones cover the bottom. There are some fish to be seen. This is where I saw my first Bluehead Wrass. We just left a beautiful anchorage between Manjack and Crab cays. We were close in to tiny rocky Rat Cay. In addition to the rocky edges there was some coral structure for the fish. Here I spotted a colorful Fairy Basslet, some Bigeyes and two lobsters. There are two big wrecks off Crab Cay. I took a long swim out to one of these and saw so many different fish I couldnâ€™t remember what was what when I got back and opened my guide. Now we are here in protected White Sound to ride out another cold front. When it passes we will jus have to go back up to Manjack for some more wreck diving. Also, the reef on the northeast side of Manjack stretches a mile out into the Atlantic. Iâ€™ll need to dive there as well. Dude. Nobody told me about the conch horns. Every evening when the bottom of the sun touches the horizon some yahoo will get out his conch horn and blow one long note until heâ€™s about ready to pass out. Then every other yahoo with a conch shell blows his in response. Proper etiquette dictates that the blowing stops when the sun is below the horizon, but occasionally some drunk lets one rip after dark. I SO have to get me one of those shells. Banyan tree with a staghorn fern. The sign points the way to the beach on Man Jack Cay or Nun Jack Cay as the locals call it. The Sea of Abaco is bordered by the island of Great Abaco on one side, and by numerous cays and reefs on the Atlantic side. There are many cays to visit in the SOA. The water is deep enough to sail in and shallow enough to anchor just about anywhere the wind will allow. Itâ€™s common practice here to leave your mainsail furled on breezy days. You can just unfurl the (easier) headsail and take a one or two hour trip to the next cay. 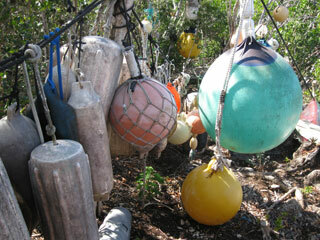 A very cool fender collection off the trail to the beach in Man Jack Cay. The passages in and out of the Atlantic can be dicey, though. Every morning at 8:15 boaters tune their VHF radios to channel 68 for the cruisersâ€™ net. Cruisers who can see the passages call in to share their observations. The southernmost cut at Little Harbor is usually one of the worst. This, of course, is the one we initially came through. North Bar and South Man-O-War are slightly more favorable. Tilloo Cut is too shallow for us. North Man-O-War is the favored inlet. 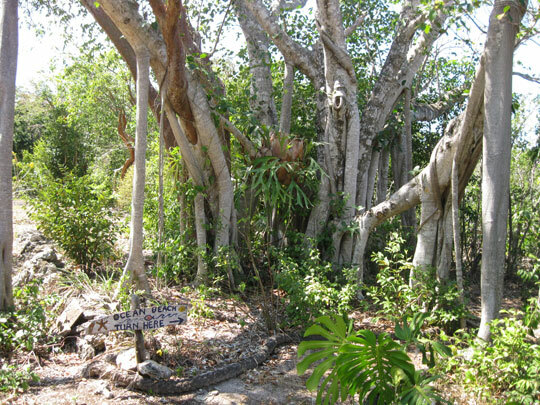 But if you want to go to the northern Abaco islands you must pass through â€˜The Whaleâ€™. Weâ€™ve heard a lot bad things about the Whale. Cruisers may wait a week for conditions to improve before tackling the Whale. We went to a pot-luck the night before we planned to take on the Whale. Some wide-eyed folks asked us â€˜Have you been through the Whale yet? !â€™ Itâ€™s enough to make a body feel intimidated. The southeast end of the Whale is a deep dredged channel. It was dredged by a cruise line who gave up on the location because they couldnâ€™t rely on getting their ships in and out of the Whale. 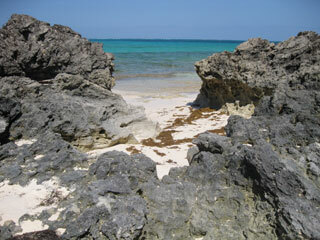 After passing through this channel you go out to the Atlantic side of the two mile long Whale Cay. 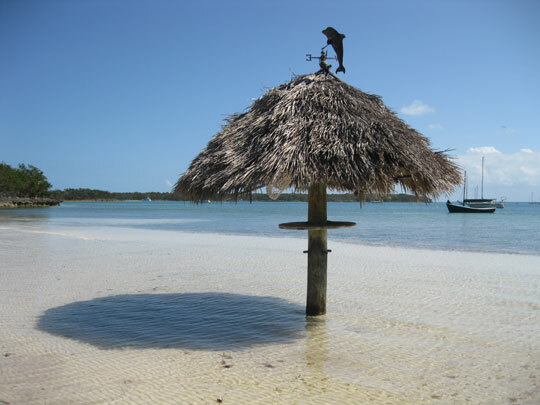 On the Northern side of the cay is a narrow channel back into the Sea of Abaco. We battened down everything a left in a mild breeze. There was a four foot roll while we were in the Atlantic, but overall it was a lot more pleasant than some of the places weâ€™ve been. Not scary at all. But I will post another Whale report when we go back through. Iâ€™m not really a sailor at heart. Sailors wait for the tide to rise. Iâ€™m not that patient. When we anchored in Bakerâ€™s Bay there was plenty of water under the keel. When we were ready to leave there was still water under the keel, but the anchor was in shallower water about 80 feet in front of the boat. I couldnâ€™t pull the boat up close enough to raise the anchor. 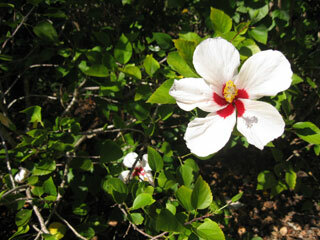 Wild hibiscus grow all over Man Jack Cay. So I swam out to move the anchor back into deeper water. I dove down and tugged enough to dislodge it. Then I saw that another boat was pulling in to anchor right behind us. From down in the water it looked pretty close. Darn. I donâ€™t want to take a chance on drifting back into that boat. I dove down again and grabbed the anchor. It weighs 35 pounds so it could hold me down on the bottom. I found that I could run eight steps holding the anchor and jamb it down into the sand before coming back up for air. I did the old eight-step anchor run quite a few times before I was comfortable with the anchorâ€™s position. Once again we got away clean. This is â€˜Runs With Anchorâ€™ signing off. PS. Duwanâ€™s post is going to tell you I broke the Wirie. I strongly believe that you should be able to dis-assemble and reassemble anything that is made of multiple parts. Thatâ€™s all Iâ€™m going to say about that. Tiki bar in the water. Just add a cold beer and we are living the life! ← The Wirie has arrived!